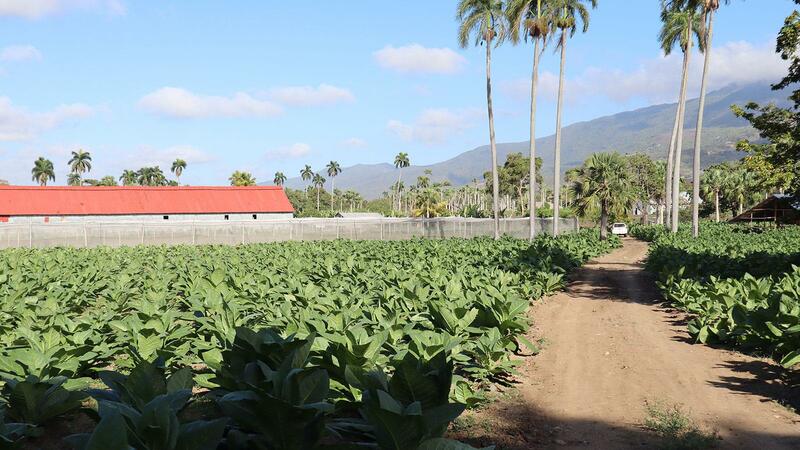 A meandering dirt path takes you through Los Cocos, Jochy Blanco’s picturesque tobacco farm in Jacagua. It may be late in the growing season in the Dominican Republic, but that doesn’t stop farmer like José “Jochy” Blanco from planting some late-harvest tobacco. It’s been dryer than normal this year, which means stronger tobacco, but there’s normally less rain towards the end of the season anyway, so late-harvest tobacco tends to be more powerful. 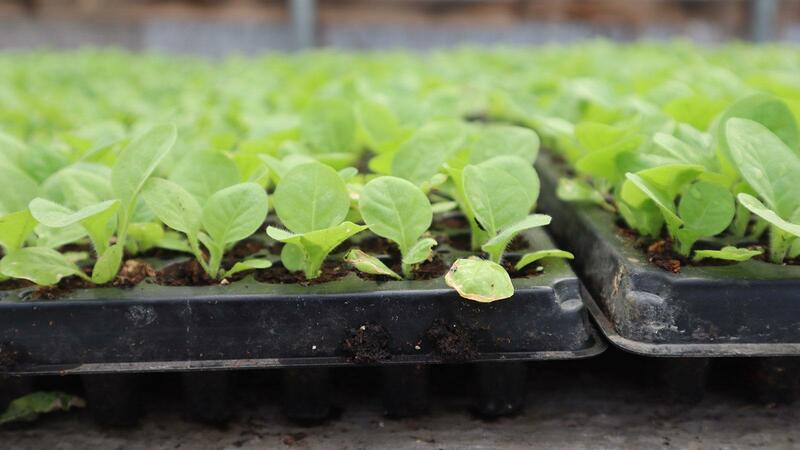 Baby tobacco plants like these start out in plastic seedling trays inside a greenhouse before they make it to the fields. 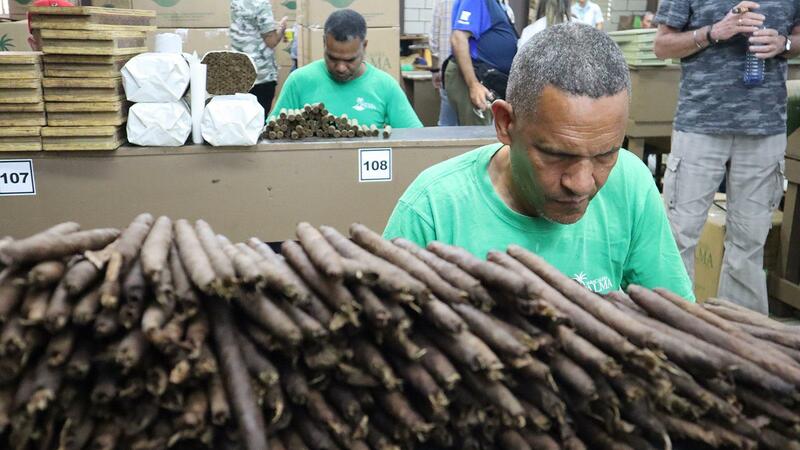 The ProCigar tour for today started at Blanco’s Los Cocos farm in Jacagua and ended at his Tabacalera Palma factory, which produces brands like La Galera, Aging Room and La Matilde. On the farm, some parts of the dirt road are packed down as hard as pavement. It seem as though the dry, solid dirt hasn’t seen rain since the Paleolithic era. Of course, Blanco has controlled irrigation, and none of the tobacco looked wilted or weak. 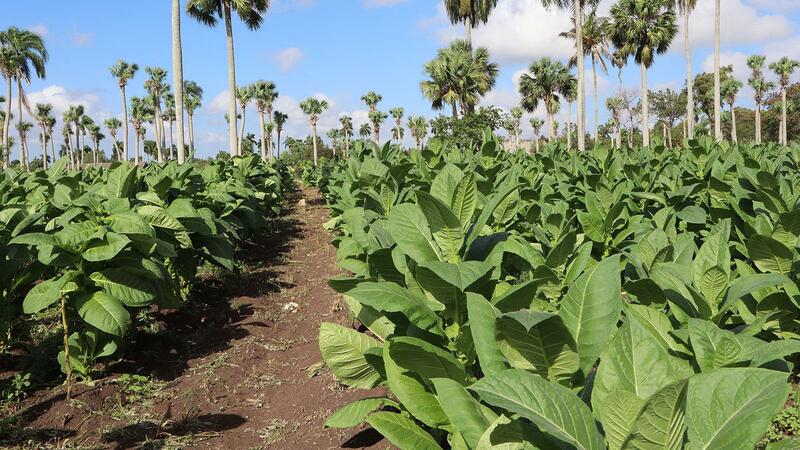 In this section of the farm, some late-harvest Criollo ’98 tobacco flourishes under the palm trees. Half the 50-acre farm grows Olor tobacco, the other half, Criollo ’98. You can instantly tell the difference, as Olor leaves are much larger and wider. “I barely have to add anything to the soil,” says Blanco about the nutrient-rich earth. The soil is naturally fertile and enjoys the microclimate of a valley. One of his fields contains some young sprouts. That tobacco will end up being strong on account of the dry weather and will be ready for harvest in about a month and a half. There are few things more peaceful than watching tobacco flutter in the breeze. 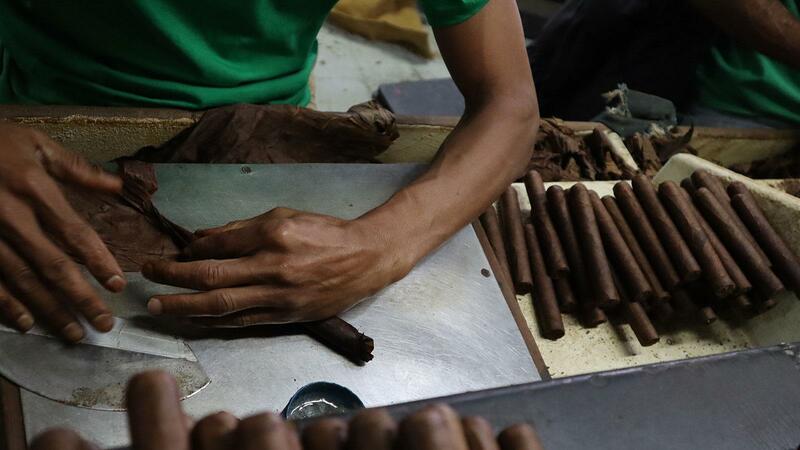 At Tabacalera Palma, a cigar roller cuts a piece of Connecticut shade wrapper to cover the next torpedo. This may sound strange, but I’ve never been to the Tabacalera Palma factory during normal operation time. It’s always after hours or just as the factory is wrapping up. Today, I got to see it in all its bustling action. Every factory I’ve ever been to has its own vibe, rhythm and personality. Tabacalera Palma is no different. High-quality wrapper leaf is supple and elastic. This roller applies one effortlessly onto a robusto. Most of the rollers were so focused on their work, they didn’t even seem to notice, or care, that I was taking photos of them. It must be annoying. Imagine you’re at your job and suddenly some strange people come in, lean over your work space or creep up behind you and start taking snapshots. Wouldn’t it be a little disconcerting? I guess they’re used to it by now. I try to be as unobtrusive as possible, but sometimes in order to get a good photo you have to get close and, yes, even a bit intrusive. At least, I feel like I’m being intrusive. 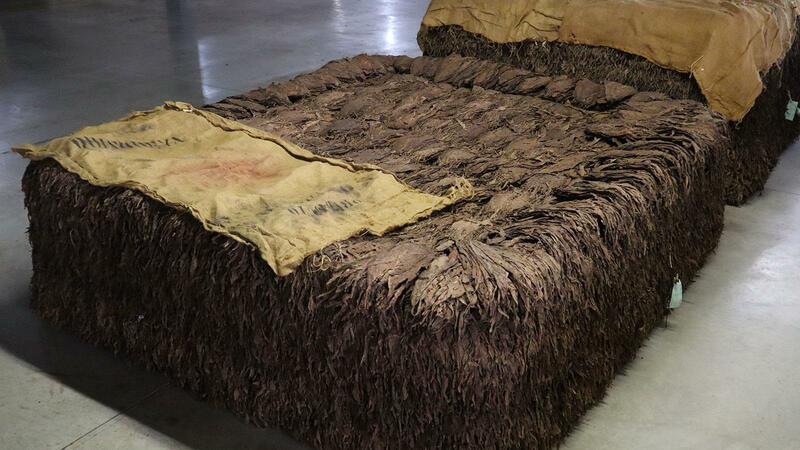 A very neatly assembled block of fermenting tobacco. Occasionally, somebody gives me an annoyed look, but for the most part, the rollers ignore me and go on with their business. After I’m through snapping pictures, I always offer them a meek gracias and then move on to annoy the next factory employee, like, for example the man who makes the fumas. The man who makes the fumas doesn’t use a mold, so he can produce a whole pile of these rustic cheroots very quickly. The man who makes the fumas. When I was done taking his photo, I took one of those fumas right off his rolling table and asked: Esta bien? Is this OK?